US President to meet North Korean leader for initial one-on-one meeting on Wednesday before summit in Vietnam. US President Donald Trump will meet North Korean leader Kim Jong Un for an initial one-on-one meeting on Wednesday evening in Vietnam, White House spokeswoman Sarah Sanders told reporters on Air Force One on Monday, according to Reuters. The one-on-one meeting between the two leaders will be followed by dinner with advisers, the report said. Trump is slated to arrive in Vietnam late Tuesday local time. On Wednesday morning he will hold a meeting with Vietnamese leaders before the start of the summit with North Korea that evening. Follow-up meetings with Kim will take place on Thursday. 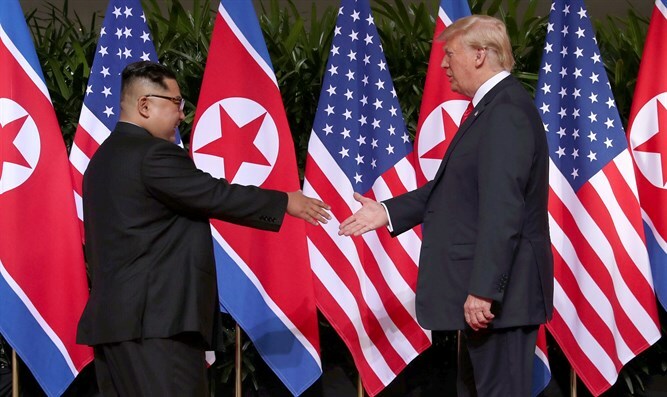 The summit in Vietnam will be the second between Trump and Kim, who held a historic summit in Singapore last June, during which they signed an agreement which includes a commitment to achieve total denuclearization of Korea, with promises to pursue “vigorous negotiations” to that end.